The New York Times published an article about Common Core homework this week. As is going to be the case with a news article (in contrast to say, a post on a blog dedicated to children’s mathematical ideas), one can’t really learn any mathematics from the piece. One critique got hit twice, though—that children are being forced to draw lots of dots. Ms. Nelams said she did not recognize the approaches her children, ages 7 to 10, were being asked to use on math work sheets. They were frustrated by the pictures, dots and sheer number of steps needed to solve some problems. I have no interest in picking up political issues surrounding the Common Core State Standards on this blog. But I do think a parent frustrated by all those dots deserves an explanation of what all those dots are for. Before we begin, please be assured that there is absolutely no mention of dots in the Common Core. What is mentioned is the array. An array is a collection of things arranged in rows and columns. We have discussed arrays before here at Talking Math with Your Kids. They are very useful tools for representing an important meaning of multiplication—that multiplication is about some number of same sized-groups. Arrays (with dots or other things) are useful tools for making these groups visible, either actually visible or visible in the mind. So I asked Tabitha (7 years old) to draw some dots for me. Me: Tabitha, [neighbor girl and best friend] wants to play. Before you go outside, can you draw that picture for me? Three rows of five dots. Tabitha (7 years old): That’s easy! Fifteen. She is probably counting by fives here. She completes her picture for me. I know that neighbor girl is waiting. I decide to press my luck. Me: What if it had been 3 rows of 6? There is a long, thoughtful pause. She shrugs her shoulders. Now is not the time to force things. Neighbor girl is waiting. So I offer a strategy. Me: Let me tell you how I think you might know it. Me: Six is one more than five. So each row would have an extra dot. That’s 15 for the 3 rows of 5, and then 16, 17, 18. We share a high five and she is out the door for a morning of clubhouse shenanigans in the backyard. Quick note: Tabitha does not let me get away with stating her strategies incorrectly. I have done this before—summarized how I think she is thinking—and when I get it wrong, she objects. I am glad about this. This is what those dots are for. They give us something we can talk about. Without those rows and columns, the conversation is so much more abstract. We were picturing those dots in our minds as we talked about counting them. The three rows of five she drew gave us a jumping off point for imagining the three rows of six we discussed. Three groups of five now has a relationship for her to three groups of six. More importantly, the strategy of finding new facts based on old facts (here that 3 groups of 6 is 18 based on knowing that 3 groups of 5 is 15), has been introduced explicitly. It is something we will talk about in the future, and something she will know to consider. Without the array, it is not at all clear to me that she would have been able to know what 3 groups of 6 is. She could have drawn 3 unorganized groups of 6, I suppose, and counted them individually. But this is a much less sophisticated strategy, and she is ready for more than counting individual objects. Many children do not naturally see rows and columns. 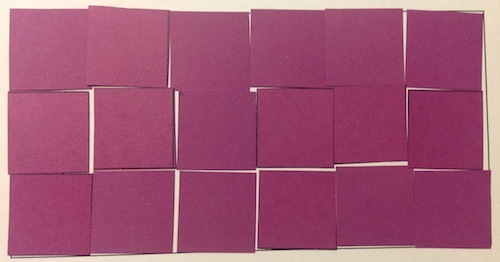 Given an array, they may haphazardly count the objects around the edge, then in the middle. This often leads to double counting and skipping things. But even children who are very good at keeping track of their haphazard counting—and who can get correct counts every time—may not see the row and column structure of an array. So put 15 pennies in 3 rows of 5. Have your child count them and notice whether she counts in rows and columns, or whether she counts in some less structured way. Model the counting yourself so that she can see an example of the rows and columns at work. Don’t worry if she doesn’t see the structure yet, but do make a note to do more of this kind of counting in the future—seeing the structure of an array is an important stepping stone to multiplication and to the measurement of area and perimeter. Then have your child put things in rows and columns. Or just have her draw dots. Tabitha received a Twister game for her recent birthday (7 years old!) She enjoys a version of the game in which one person spins and the other follows instructions until, as Tabitha puts it with much delight, the cookie crumbles. The players switch roles for the next round. No score is kept. She wants to play a round one recent Sunday evening. I have been writing, so I have her set it up in the kitchen while I finish up. She comes back to me with questions. Tabitha (7 years old): Daddy! What’s six plus six plus six plus six? Me: Wait. How many sixes? T: Yes! I counted them right! She takes me into the kitchen to show me the Twister board. T: See? One, two, three, four, five, six. She is counting the green dots in one row. She is counting the rows. Me: So four sixes is 24. Nice. Can I show you something cool? It’s also six fours. See? One, two, three, four. I am counting the dots in one column—each a different color. Me: Then one, two, three, four, five, six. I am counting the columns. Me: So four sixes and six fours are the same. She is referring to a recent homework assignment in which dominoes were used to demonstrate that 6+4 is the same as 4+6, and that this is true as a general principle about addition. Rows and columns are fun, fun, fun. Malke Rosenfeld of Math in Your Feet reminds me regularly that children love to play in structured space. She uses blue tape on the floor for her math/dance lessons and has noticed that children love to play freely in and around the spaces created by the tape (seriously: click that link, have a read and then go buy some painter’s tape!). The same thing is true for the Twister board. It creates a structured space for Tabitha to explore at a scale that allows her to use her whole body. That’s a good time for a seven-year-old. 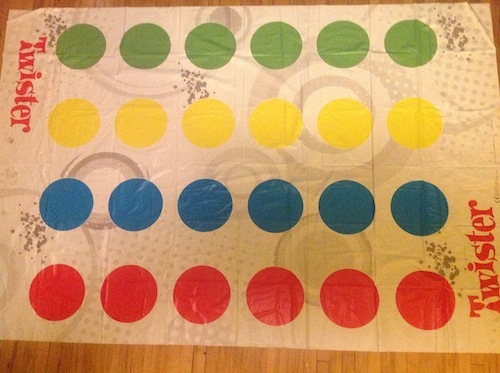 But children don’t always notice the rows and columns in an arrangement like the Twister board. They need to learn to notice it. This is an important step on the path to learning multiplication. The fact that our conversation began with “What is 6+6+6+6 ?” tells me that Tabitha notices the rows and the columns. She knows that the answer to 6+6+6+6 should be the same as her count. By introducing the language of “four sixes” and “six fours”, I am trying to help her notice the multiplication structure underlying her ideas. Arrange things in rows and columns. When you do, the whole thing is called an array. Point out arrays in the world. Count the number in each row together, and count the number of rows. Notice together whether the numbers switch if you count the number in each column and count the columns. Does eight rows of six become six columns of eight? Does this happen for all numbers? Here are some of my favorite arrays. I want to suggest a lovely post by somebody else. It is written by a math teacher who converses with his niece (who is 7 years old) about rectangles and multiplication. As an example, the rectangle below shows that 6×3 is 18. Or is it that 3×6 is 18? That becomes the focus of part of the conversation. The girls’ parents look on as the discussion unfolds. What he means by this is that children can learn from thinking about math, even if they don’t end up with the right answer, and even if they do not experience the full story (here, that multiplication is commutative, which means AxB=BxA for all possible numbers). Finally, non-math teacher parents may be interested to learn that—consistent with Fawn’s observation—a regular piece of feedback I get from math teachers on my writing here is how impressed they are by my ability to not worry about Tabitha and Griffin getting right answers. 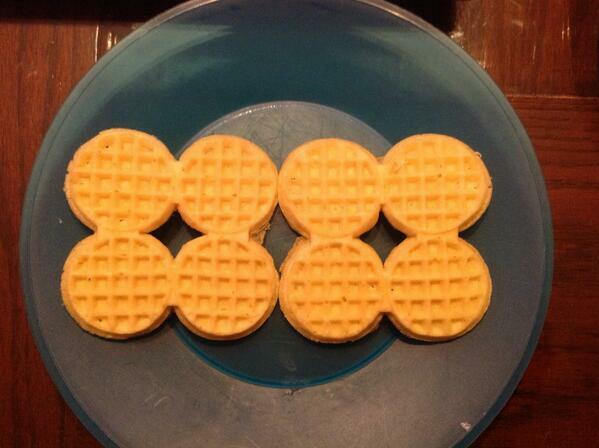 Those Eggo mini-waffles are paying off. Me: There you are, Tabitha. Two sets of waffles. Tabitha (six years old): That’s 7. No…8! Me: [washing dishes with my back turned to her] Right. Two sets of four is eight. T: That’s not how I know. Me: Oh. How did you know, then? T: Three plus three is six. And there’s 2 more. I recently pushed Tabitha past the limits of her patience by asking about lobsters and half-lobsters. But in doing so, I was continuing to lay the groundwork—how she thinks about things is interesting to me. I want to know, I value and reward her thinking. So she talks about it. When you consistently talk math with your kids, you will make progress. It may seem slow at times, but you’ll make progress. Mathematically, there is something really wonderful going on here. She is trying to figure out 4+4, but it’s not a fact she has handy. So she thinks of 4 as 3+1. Now it’s 3+1+3+1, which she rearranges as 3+3+1+1, which is the same as 6+2. She uses a fact she knows (3+3) to find one she does not (4+4). This is an example of using derived facts, which Griffin did also in a recent conversation about the number of fives in an hour. Listen for the times that children announce how many things there are. Ask them how they know. Another example: Griffin had his ninth birthday party recently at a local swimming pool. The cake was provided; the high schooler who brought over the cake asked me his age and proceeded to count candles from the pack. It was hot; the candles must have slightly melted into the container because she was struggling and took a good minute or two to dislodge the candles, leaving them on the table before disappearing. She had left eight candles behind. For a nine-year old’s cake. You just have to put up with a few strange looks from children sometimes.